Diabetic foot care encompasses steps that are aimed at preventing infection and relieving the pain associated with diabetic neuropathy. A neuropathy is a disorder that affects the nervous system. A diabetic neuropathy can affect nearly any part of the body, but the feet are typically affected first. Neuropathies do not affect the central nervous system, which includes the brain and spinal column, but the peripheral nerves which transmit signals to the brain, via the spinal column. In diabetic neuropathy, the nerves are not functioning properly. So, the signals that are transmitted to the brain are abnormal. It is important to recognize the symptoms and spend extra time inspecting the feet, checking for injury or infection on a daily basis. Infections can go unnoticed leading to ulceration and gangrene. In some cases, partial or total amputation is required to prevent blood poisoning. High glucose or blood sugar levels over a long period of time cause damage to the blood vessels that supply the nerve endings, throughout the body. Since, the blood vessels and the nerves in the hands and feet are some of the smallest; those are the areas of the body that are affected first. The nerves and the blood vessels depend on each other. 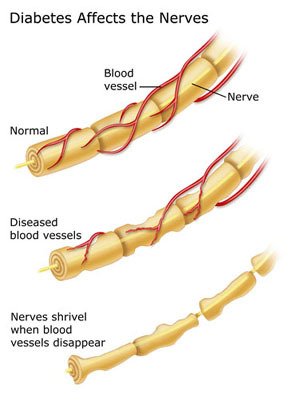 The nerves control dilation and constriction of the blood vessels. In order to function properly, the nerves need adequate blood flow. If blood flow is reduced, the nerves may cause constriction of the blood vessels, which further reduces the blood flow. Eventually, the nerves can simply die, due to lack of oxygen and nourishment from the blood. When the nerves die, the blood supply to the toes and other extremities is reduced even further. So, the condition may become progressively worse, even when blood sugar levels are kept under control with medication and proper diet. Doctors theorize that in type II or adult-onset diabetes, the earliest damage may occur before a person even realizes that they have diabetes. Prescription drugs, such as anti-depressants or anticonvulsants may be prescribed, but there are no treatments, currently, that will reverse neuropathies. Tight blood glucose control is essential to help prevent the conditioning from progressing rapidly. Effective diabetic foot care helps to relieve the pain and prevent the most serious complications. What Are the Essential Steps for Diabetic Foot Care? 1. Inspect your feet daily. Use a mirror if necessary to see the bottoms of your feet or the area between your toes. 2. Any sores or blisters should be treated with an antibacterial ointment and covered with a bandage or treated by a physician. Do not attempt to remove corns, calluses or ingrown toenails at home. See a podiatrist in the case of swelling, increased redness, pain or signs of infection. Healthifeet Foot Cream—contains the amino acid L-arginine which may help improve circulation and “warm up” cold feet. Total Foot Recovery Cream with Tea Tree Oil—Tea tree oil has natural antibacterial activity, which may help prevent infections, one of the goals of diabetic foot care. 4. Never go barefoot. A splinter or tiny scrape can lead to a serious infection, because of reduced sensation and because of reduced blood flow. 5. Wash your feet daily with warm (not hot) soapy water. Do not use a heating pad or hot water bottle to warm cold feet, a burn could occur. 6. Trim your toenails carefully and cut them straight across the top, to avoid an ingrown nail. 5. Wear seamless socks that do not restrict circulation. Choose orthopedic or therapeutic footwear designed specifically for diabetic foot care. There are a number of different orthopedic shoe styles to choose from, as well as seamless socks designed specifically for diabetic feet. They will not restrict circulation, but resist sagging and bunching. Another good alternative for diabetic neuropathy and diabetic foot care, in general, is the Arch Craft customized insole, which can be worn with your own shoes. They cradle your feet in comfort, eliminating pressure points and pain, without restricting circulation.